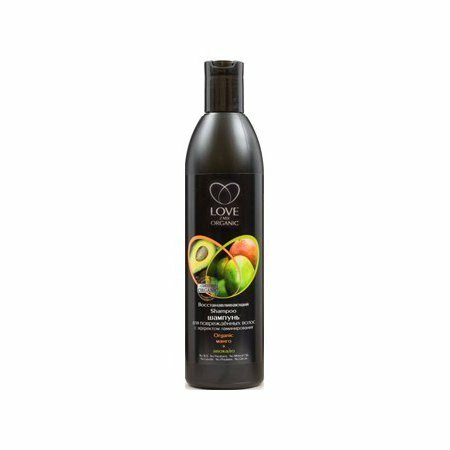 Organic Mango + Avocado Laminating Shampoo is produced by the Russian beauty brand Love 2 Mix Organic. It is specifically designed to repair damaged hair and to make it silky smooth. Suitable for daily use. The product is enriched with organic mango extract and organic avocado oil. These ingredients actively nourish damaged hair and repair its structure, prevent brittle hair and split ends. The shampoo creates a thin protective layer on the surface of your hair, providing a laminating effect. It makes your hair smoother and tamer, restores its natural shine. Formulated with certified natural and organic ingredients. Free of SLS, parabens, mineral oils, phthalates, glycols, lanolin. Has a unique laminating effect. The shampoo coats each hair with a fine film, making it smoother, thicker and shinier. Has a bright, tropical scent that gives you a mood boost. Ingredients: Aqua with infusions of Organic Mangifera Indica (Mango) Fruit Extract, Organic Persea Gratissima (Avocado) Oil; Magnesium Laureth Sulfate, Cocamidopropyl Betaine, Lauryl Glucoside, Sodium Cocoyl Glutamate, Glycol Distearate, Bis (C13-15 Alkoxy) PG-Amodimethicone, Guar Hydroxypropyltrimonium Chloride, Hydrolyzed Wheat Protein, Hydrolyzed Rice Protein, Benzyl Alcohol, Sodium Chloride, Benzoic Acid, Sorbic Acid, Parfum, Citric Acid, Lucepene. Want to buy Organic Mango + Avocado Laminating Shampoo? Call us or submit your order via our web site! Love 2 Mix Organic (Love2Mix Organic) is a Russian natural cosmetics brand that offers a unique series of hair and body care products. It comprises shampoos, hair masks, body creams, body butters, body soufflés, body scrubs and shower gels. Each product is formulated with a blend of organic extracts derived from fruits, berries and/or herbs. This explains the name of the brand: Love 2 Mix Organic means that its creators love to combine organic ingredients for a better effect. But they do not only try to find new effective combinations but also stick to traditional recipes, improve existing formulas and use only certified raw materials grown on the company's farmland or exported from abroad. These principles allow the company to produce only high-quality and safe products. Each Love 2 Mix Organic mask, shampoo, scrub, cream or shower gel is a combination of nutrients, amino acids and natural vegetable oils. Love 2 Mix Organic cosmetics are formulated with organic plant ingredients which undergo strict eco certification procedures. These products are free of SLS (sodium lauryl sulfate), SLES (sodium laureth sulfate), synthetic dyes, fragrances and preservatives. They are affordable yet effective, providing gentle care for your hair and body, restoring their natural health and beauty. Besides, each product has a delicious scent which transforms routine procedures into spa rituals.